The Nigerian team representing the country in the International Association of Athletics Federations (IAAF) World Championships London 2017 is yet to win any medal in the ongoing contest. But the country’s hope was kept alive as Glory Nathaniel on Monday qualified for the semi-finals of the women’s 400m hurdles, after running a personal best record of 55.30secs in the first round. Nathaniel, drawn in lane 3 of the fifth and final heat of the first round, was impressive as she placed third to pick one of the four automatic slots on offer for a place in Tuesday’s semi-final. Her reach to the semi-finals makes her the 5th Nigerian woman after Maria Usifo (1987), Omolade Akinremi (1995), Muizat Ajoke Odumosu (2009 and 2011) and Amaka Ogoegbunam (2009) to qualify for the semi-final at the championships. Meanwhile, Margaret Bamgbose, Patience Okon-George and Yinka Ajayi crashed out of the women’s 400m. Bamgbose, who was a semifinalist in the event at the Rio 2016 Olympics, finished last in her heat in 52.23secs, US athlete Phyllis Francis won the heat in 50.37secs. While Ajayi finished in the 6th position in her heat in 52.10secs. 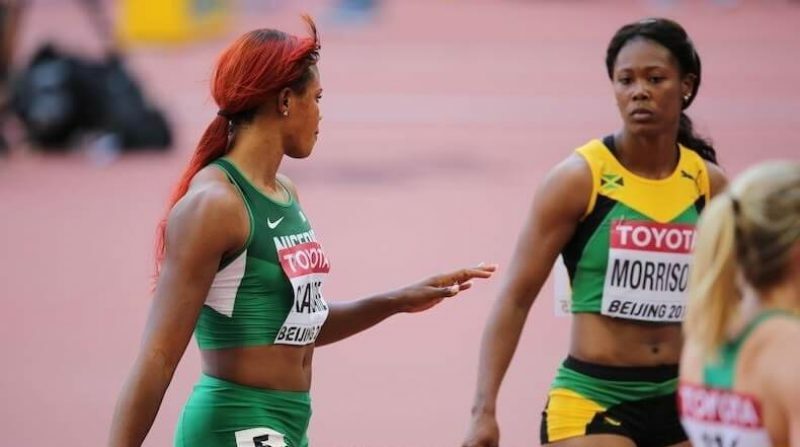 she ccompeted against former Nigerian athlete Salwa Eid-Naser of Bahrain. The Bahraini won in a national record time of 50.08secs and Allyson Felix of USA finished second in 50.12secs. In the men’s triple jump, Tosin Oke crashed out as he jumped 16.17m to finish 12th in the qualification group B of the event. He finished 25th overall in the event, which featured 30 athletes. Ethiopia, South Africa, Uganda and Kenya have registered their name on the medal chart in the ongoing event.